Jobsoid is based on the core belief that Recruiting is a Team effort and hence should be Collaborative. Hence we do not have any restrictions on the number of user accounts in Jobsoid (apart from the free plan of course). Hence inviting your team members to Jobsoid is the first step you must take before even posting your job openings. The process of creating user accounts is pretty simple. Just follow these steps to invite all your team to collaborate with you. You will need to fill in the following details on Add New User screen. First Name, Last Name, Email and Mobile. Kindly note that the Email address will be required for verification and cannot be changed later. An Invite will be sent via email to the Email address you specified. Now your User will need to click the Activate Recruiter Account Link in the email to proceed with signup. On the Confirm User Account page, the User will need to specify a password for the New user account and click Save. The New User can now login into Jobsoid using the Email Address (Username) and Password specified in the last step. 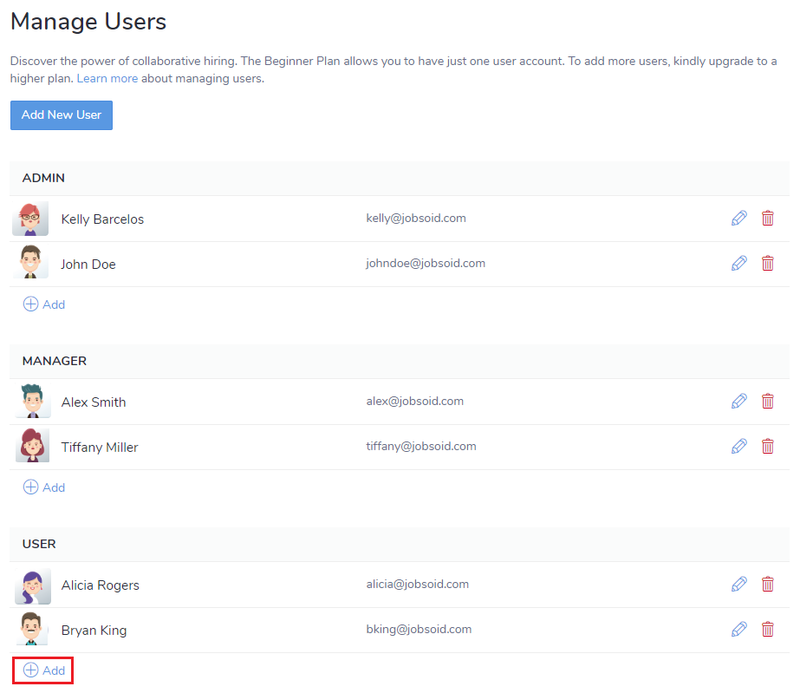 You can also add users directly to specific user roles. Under desired category, click on (+) Add button which is present right below the names of the users.